Greetings from Adelaide! Wishing we were still there, we have just completed our trip through the outback. It was great the whole time and has been the highlight of Australia. We spent a few days in Alice catching up on sleep and enjoying the town and really liked it. It's such a random place. Our short walk over to the original telegraph station ended up turning into a trek in the scorching heat, however! It was still cool though and there were lots of wild parrotts hanging around when we got there. 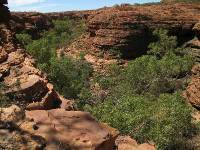 Our first stop out of Alice was at King's Canyon which we walked through and enjoyed the incredible views. Lara's loving how Australia is practically one big geography lesson (but not the flies). 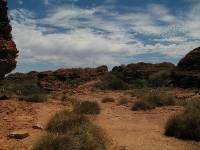 From here we travelled to Yalara campsite where had 2 nights and a day around Uluru. 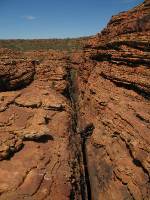 Some famous landmarks can disappoint when you see them for real but Uluru certainly didn't. It was incredible and watching it change colour as the sun rose behind it was really special. 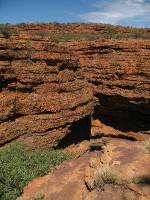 As was the 9km trek around the base - seeing it up this close reveals so much more detail and, with the Aboriginal creation stories, adds another dimension to it. And yes, it really is that reddy/orange colour first thing in the morning - although that has been created from all the sand blowing over it over thousands of years. 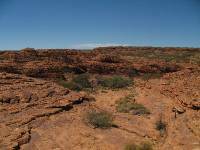 Equally incredible is Kata Tjuta (the Olgas) - which actually is more important and significant to the Aborignal people than Uluru, but they ask for the publicity to be kept to a minimum because of it's importance. 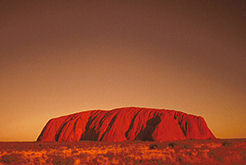 They were created during the same natural processes, but Kata Tjuta is a series of bulbous rocks rather than one big one. We walked into the middle of this formation, which offered much needed shade, but also a feeling of being very small in the centre! Following 2 great nights sleep outside in SWAGs (in Yalara) we headed on an 850km drive towards the unique and strangly cool opal mining town of Coober Pedy just over the state border in South Australia. Everybody lives underground to keep cool (apparently the record temp is 63c) and it had a great atmosphere for a small, single industry town - although slightly scary! It's a very small town - if you know what I mean ;) They had to introduce their own terrorism laws way back in the 90's because (due to the abundance of dynamite) the locals were blowing each other up - someone blew up the local TV times printing station because they printed the wrong times of Star Trek one week! It was interesting to see how opals were created and also how much money is in it - locals can't mine in the town centre anymore but they can "rennovate" their homes as often as they want - needless to say finding small fortunes. Although noone will ever tell you what they earn/find. After an enjoyable evening in Coober Pedy, and sleeping in underground dorms we made our way down to the coast at Port Augusta before turning back towards the sheep/cattle station (cattle stations in the outback are huge - some are bigger than countries in Europe) of Rawnsley Park, where we spent the night - and saw our first real live Kangaroos! Yay! It was nice to finally see the sea again, and water for that fact! The salt lake we visited on the way down was incredibly beautiful (if so bright it hurts your eyes!) but reminded us how precious water is in these parts. 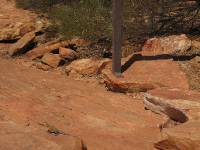 The next morning we had the most challenging trek of the outback trip, up Mount Olssenbagge in Wilpena Pound, Flinders Ranges. The climb up wasn't too bad, but with the unrelenting sun and heat made for a tough couple of hours. Getting to the top (helped along with two litres of water each) made the effort well worth it. Great views all across Flinders Ranges, and the outback - massive expanses of nothing for as far as your eyes can see! Sometimes it's hard to imagine how huge Australia is, and how there's nothing in most of it - we once passed a road sign saying "Warning: No fuel for over 500km"! Our final night on our outback trip was in Parachilna, which has a population of 6! It was a great little place, mainly because it only consists of a bar and our dorm accommodation! A major highlight was the bbq though, where we got to taste kangaroo, emu and camel. Pug approves of all of the above. Oh and lets not forget the main tourist attraction - the longest cargo train in the world which goes past between 7-midnight every day! (thought Grampy Pete might appreciate it though). It was a nice last evening with our group, Ollie was very drunk on goon (ultra cheap box wine) with Pug not far behind - Pug decided to visit the pool at 1.30 in the morning along with Fabrizio (crazy, hilarious Italian - he likes cheescake) and Maz (unintentional in that she got thrown in!). Then it was onto Adelaide. It was very strange to be back in a city, especially so big - quite a shock to the system. We are really gutted however that the trip down wasn't longer as we had such a fantastic time - wanted to sleep in SWAGs one last time and experience the real Oz for at least a few days more. Anyhows, it's off to the East Coast for us now - which we've heard is a bit like a frat party! P.S. Lara was ultra happy on discovering the Grand Slam news at Parachilna! Wohoo! Shame missed most of the games though.